The models SV7 / SV14 / SV20 and SV30 can be developed for this purpose with a cooling kit, which contains an extra fan. This extra fan is installed in a facade on the house’s shadow side – and gets connected to the SolarVenti Control or thermostat inside the house. 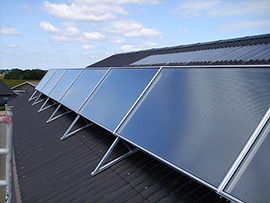 When the indoor temperature exceeds the maximum set on the thermostat, the solar air collector stops running. Instead, the extra fan will take over thus making it possible to shift between cool and warm air input according to your needs.The extra fan will supply cool air from the shady side of the house thus lowering the indoor temperature. The extra fan on the house’s shady side is driven by solar cell, which is mounted in the SolarVenti solar air collector panel. This also means the extra fan has no operating cost or maintenance.